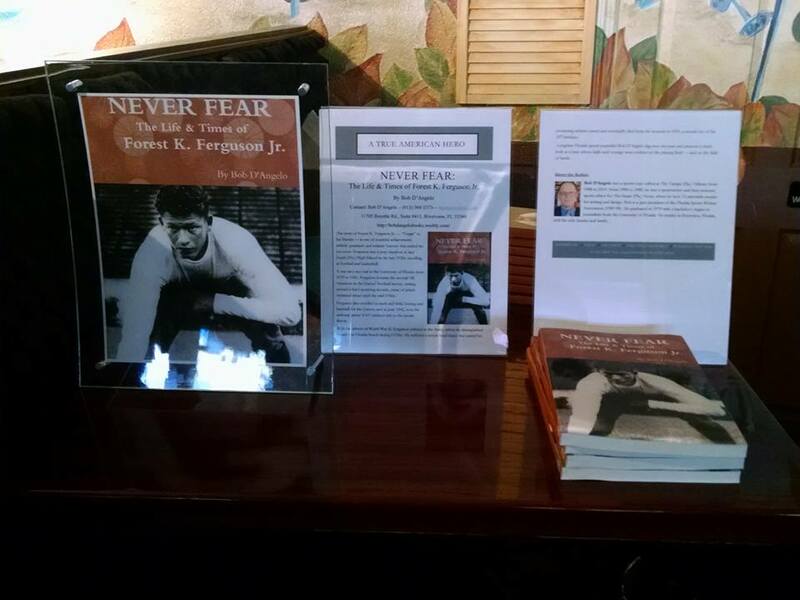 Never Fear: The Life & Times of Forest K. Ferguson Jr.
Forest K. Ferguson Jr. was a great athlete and a military hero. 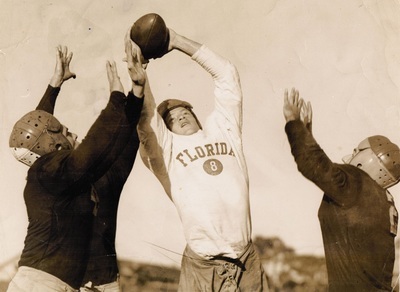 He excelled at tiny Stuart High School in the late 1930s and at the University of Florida from 1939 to 1941, where he became the second Gators football player to be named an All-American. 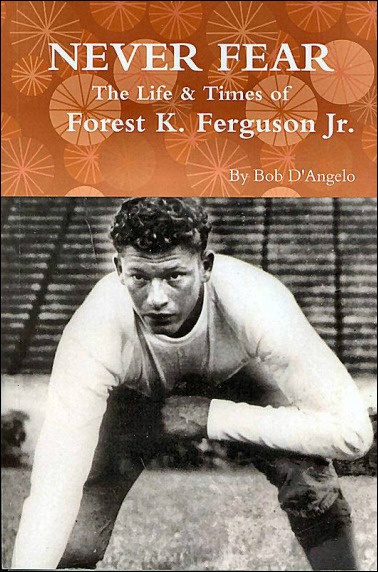 He might have made it to the NFL, but "Fergie" followed a different calling. He joined the Army and became a World War II hero who won the Distinguished Service Cross for his courageous actions on D-Day. Severely injured at Omaha Beach, Ferguson's athletic career was over. Ten years later he died from his war wounds. Backed by diligent research and interviews with family members, teammates and military peers, "Never Fear" is a fresh look at a man whose skills and courage were evident on the playing field -- and on the field of battle. Cost is $15.95 plus $3 shipping. The plaque dedicated to Fergie in his hometown of Stuart on Memorial Day 2015. Bob being interviewed after the Memorial Day dedication for Forest Ferguson. 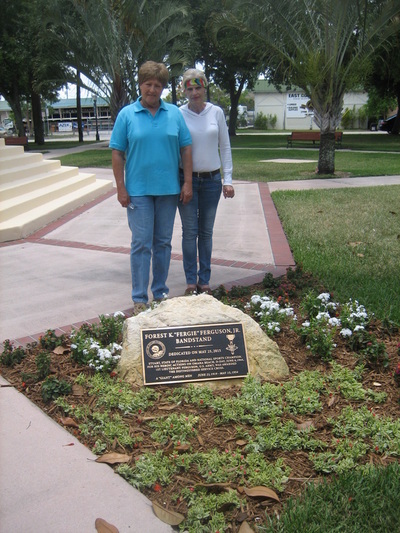 Fergie's surviving relatives. 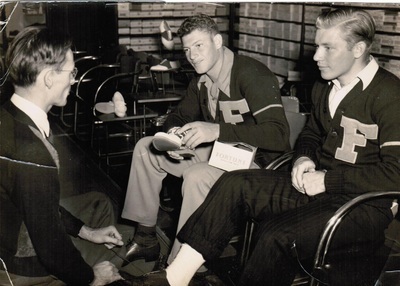 His nieces Kay, left, and Deborah, at his plaque dedication in Stuart, Fla.
Fergie and teammate Tommy Harrison try on shoes. A local shoe store gave out free shoes when a player blocked a kick. 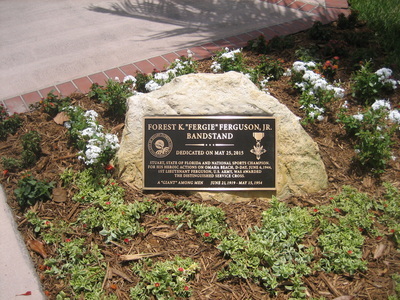 Because of his height, a pass was always within Ferguson's reach. 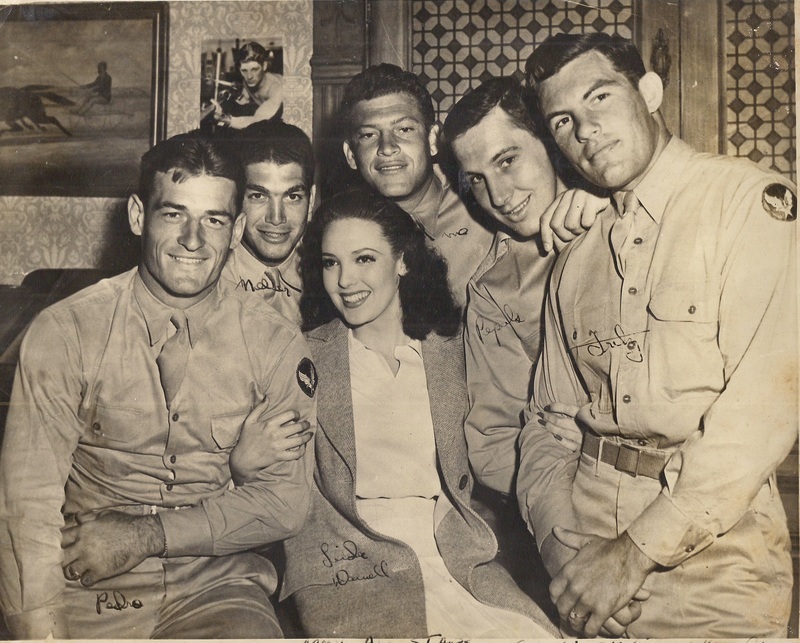 Fergie goes to Hollywood and meets actress Linda Darnell, along with other members of the Army football team. 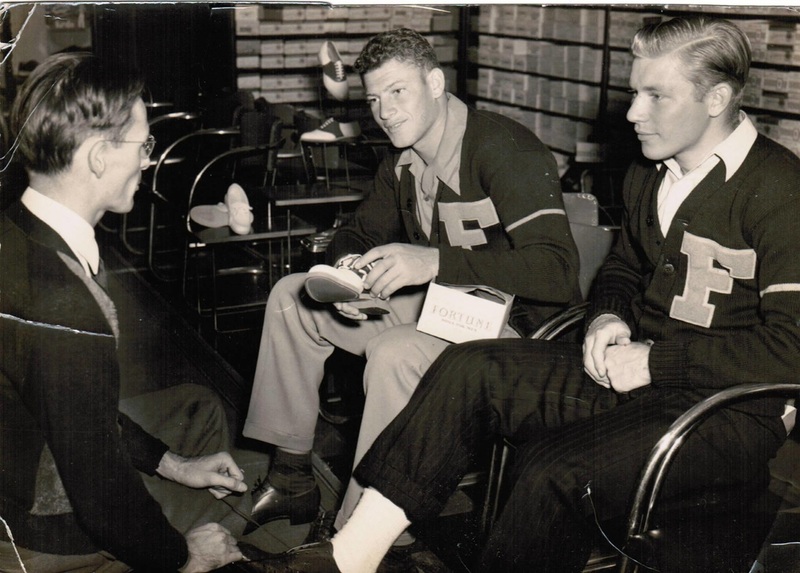 Fergie gets his knee worked on by the trainers. 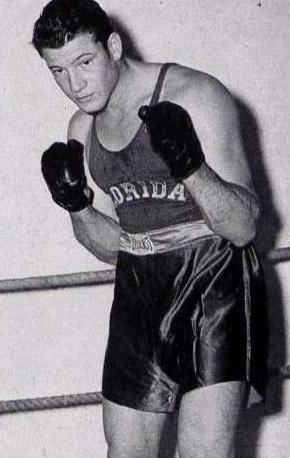 Fergie was a boxer for the Gators in 1940 and '41. All set up at the Pinellas County Gator Club in St. Pete Beach, Aug. 15, 2015. 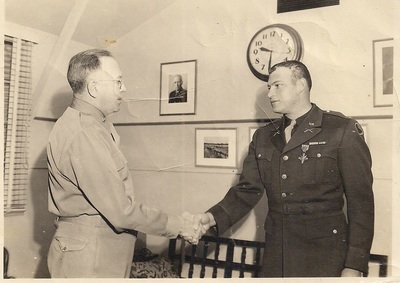 Fergie receiving his Distinguished Service Cross in an Atlanta hospital in December 1944. Fergie (right) at age 10, with his 13-year-old sister Aurora and 8-year-old brother Wilbur. 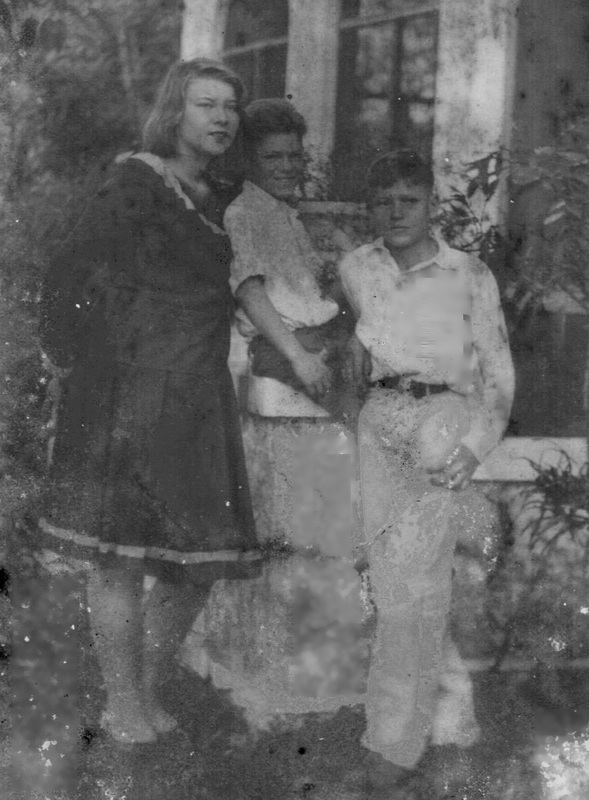 Taken in 1929. "Never Fear" gets Bronze Medal! 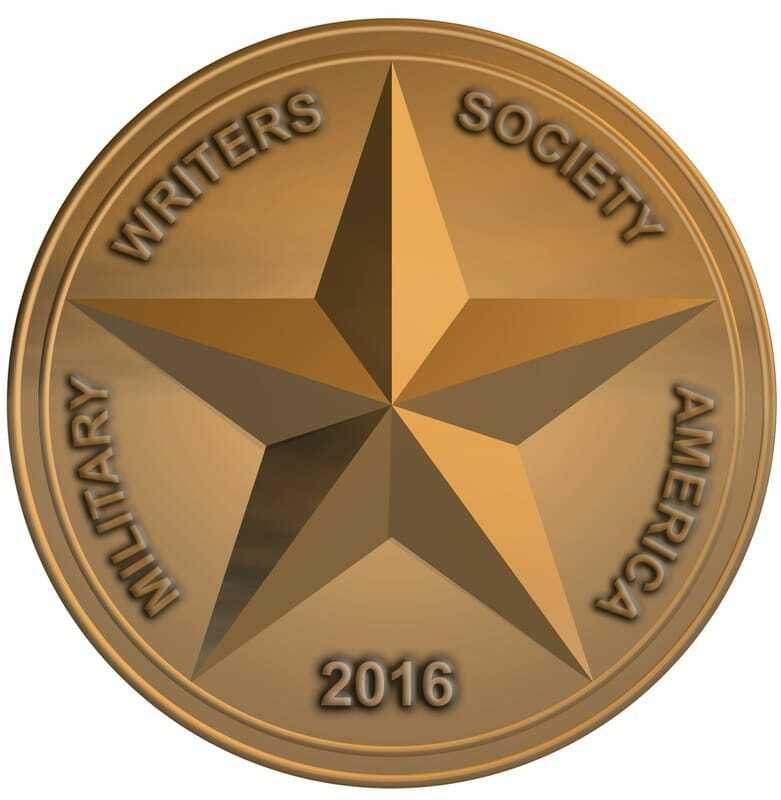 On Dec. 20, 2016, "Never Fear"was awarded a Bronze Medal by the Military Writers Association of America in the 2016 biography awards category! 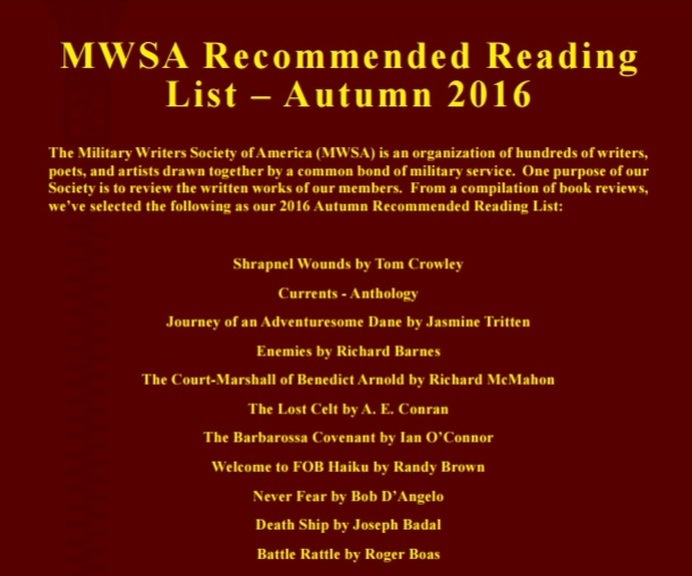 "Never Fear" makes MSWA's Recommended Reading List for Autumn 2016! "The story of Ferguson is one that needs to be told. 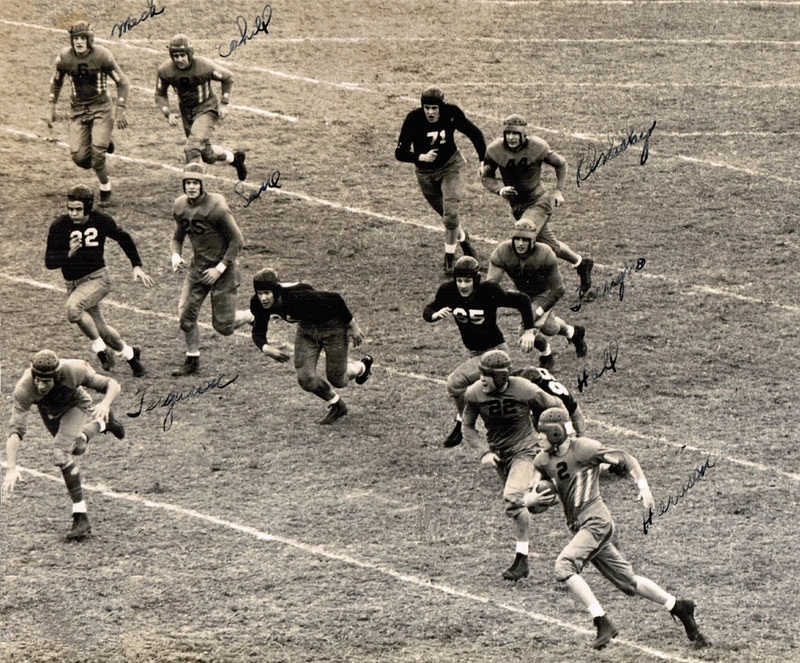 It is tale of football, The Great Depression, patriotism and down-home family values (something sorely lacking in today’s world). 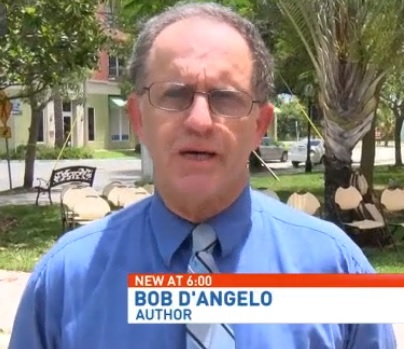 The book is as much about World War II as it is about football and a man who paid the ultimate price in the defense of his country." 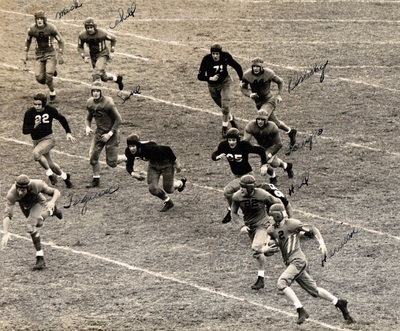 -- Ron Keurajian, Sports Collectors Digest. 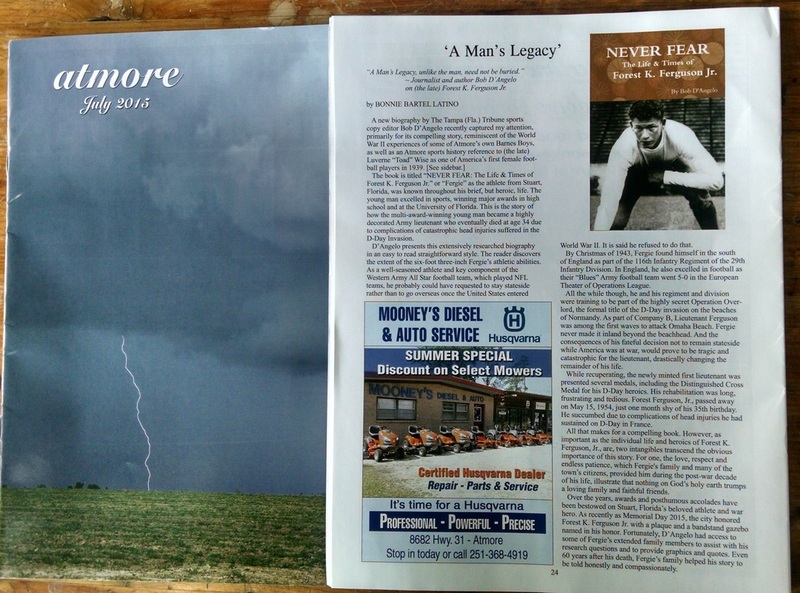 "Never Fear" featured in July 2015 issue of Atmore magazine in Atmore, Alabama by military/romance writer Bonnie Bartel Latino! 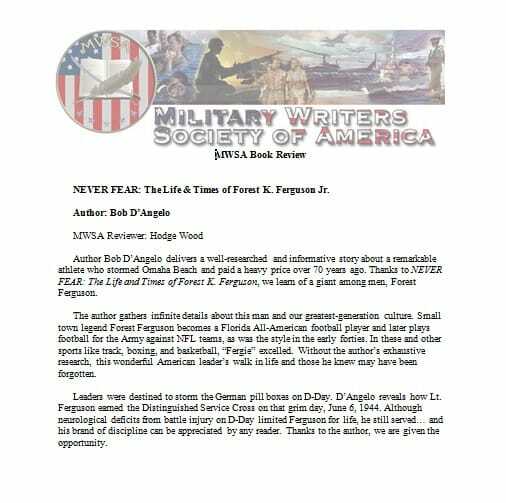 A review of "Never Fear" was published in the July 2015 edition of Atmore (AL) Magazine, in an article and sidebar written by award-winning military/romance writer Bonnie Bartel Latino. She writes that "D'Angelo presents this extensively researched biography in an easy to read straightforward style," and calls it "a compelling book."